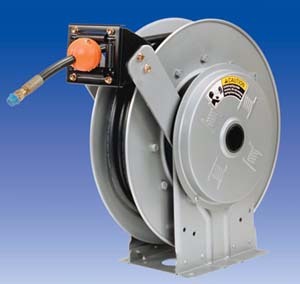 Hannay Reels popular N700 spring rewind hose reel has been enhanced with service, efficiency and safety features to meet an even broader range of applications. The N700 can accommodate single 3/8" or 1/2" I.D. hose. The standard inlet is a 90° swivel joint with 1/2" female NPT threads and the standard outlet is 1/2" female NPT threads. It operates at pressures to 3000psi (207 bar) and handles product temperatures from -20° to +225°F.